Some of us are going to default to being quiet and trying to stay in a dark room with pillows and Netflix/Amazon/Xfinity access for the next few weeks as the only way to get through what happened in this horrifying election. I'm not going to advocate for substances or mood-improving drugs but hey, if you have those, godspeed. Despite those urges, this is also a time for loud resistance and protest, and some Bay Area residents took to the streets already, Tuesday night, before Hillary Clinton had even conceded this disaster. Here's what we've seen so far via the Bay Area media and our own cell phone cameras when it comes to everyone being horribly sad and baffled that an orange fascist with sexual assault and racist tendencies is now our president, but hey, yay America. We'll add to this post as needed. There were rumblings of a march down Market Street in San Francisco that have yet to emerge, and there was immediate evidence of one in downtown Oakland, in addition to a protest that stalled traffic on Highway 24. As KTVU reports, windows were being broken in Oakland, and BART's 12th Street Station was shut down for some period of time. Below you can also see a video shot in Berkeley in which people are shouting "Not Our President!" 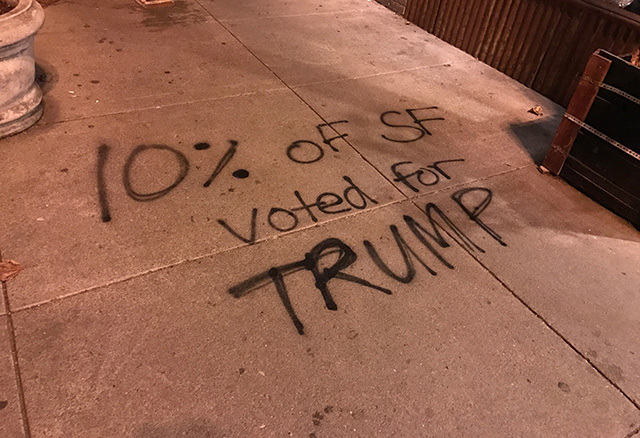 As seen on a sidewalk around midnight at Market and Noe. 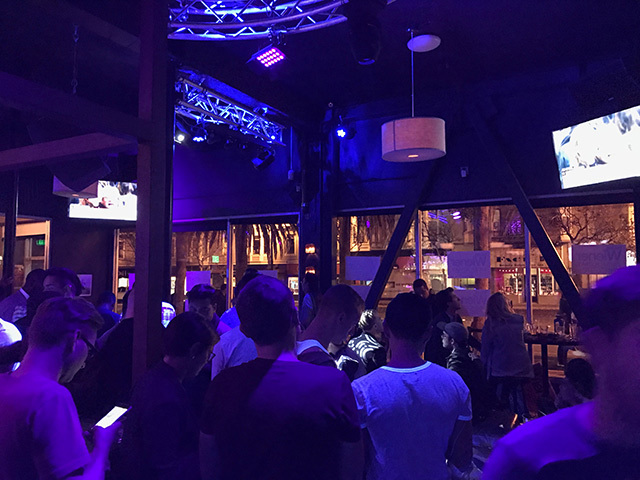 The scene at Scott Wiener's victory party at Beaux, which was kind of unhappy. To our north, a protest broke out in Portland, OR. Also, here's Judd Apatow's hot take. Meanwhile, Trump supporter Peter Thiel issued a statement. So. Yeah. Get ready. First, find a boat/ship someone in California will join you and Donald on, Pete. Below, some video from 14th and Broadway in Oakland.